With services like Vudu, iTunes movies, Netflix, Hulu, YouTube, UltraViolet, etc. streaming is growing at a dramatic rate. Fortunately, many movies look pretty good these days when streamed in 720p or 1080p, but much of the content found on YouTube, etc. leaves a lot to be desired. In addition, technologies like AirPlay, Miracast, MHL are increasing the frequency of connection between mobile devices and big screens. In many cases, the quality will be pretty poor due to the low resolution and compression artifacts. Adaptive scaling works with everything from SD to UltraHD (4Kx2K) devices. The technology has the ability to scale in both horizontal and vertical directions while preserving image detail in video content and suppressing ringing artifacts in graphic content. Mosquito noise is a common artifact in discrete cosine transform (DCT) compression schemes such as MPEG. The artifact is generated during decompression when the decoding engine has to replace lost data using approximation by inverting the transform model. The mosquito noise appears as random aliasing and, as display size increases, mosquito noise and other artifacts become more noticeable. Mosquito noise can occur with HD content, but is typically more noticeable in SD video because of the lower pixel density and a larger pixel size. 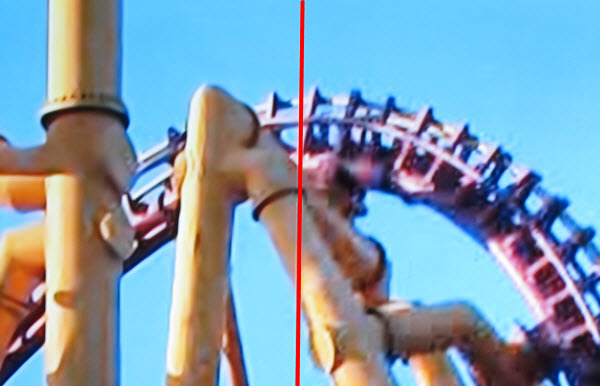 The image below shows mosquito noise around the transition from the roller coaster to the sky. Edge enhancement dates back to the early days of faxes, where edge contrast was boosted to improve perceived sharpness (as sharpness is a perception based partially on contrast). In printing, unsharp masking does the same thing. With ClearView, both image and text sharpening are carried out simultaneously and independently, allowing for the highest quality images without adding visible noise. This actively removes jaggies that are commonly seen in upscaled or zoomed content. Jaggies can also be caused by lossy compression, poor quality de-interlacing, or resolution limits in digital sampling of images. Smoothing results in a high definition looking images without softening the entire image. This technology is especially useful when scaling low resolution output from mobile devices or streamed internet content. I had the chance to see a live demo at CEDIA and found it to be very impressive. The image below shows a split-screen display with ClearView applied on the left. Below is a larger view of one section. 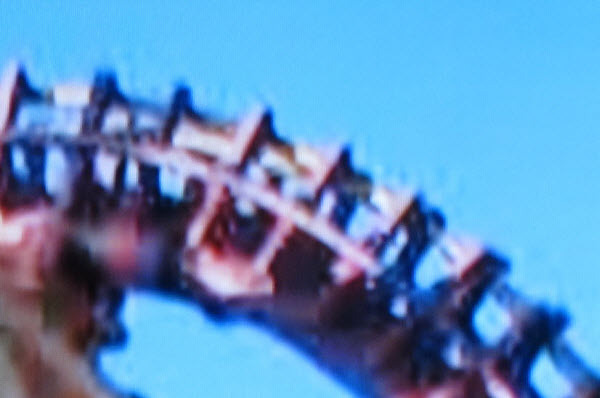 The blue sky around the edge of the rollercoaster is much cleaner and the image is much sharper. ClearView definitely lived up to its promises. As this technology is incorporated into AV receivers and display devices, viewing of poor quality content is destined for dramtic improvements. Further, as the industry prepares to transition to the new 4K ultra high definition standard, existing HD content (e.g. Blu-ray), will benefit from the high quality upscaling to 4K. Let’s hope the cable companies don’t catch on and start compressing things even further.